Feel free to come and watch a class to see first-hand what it is like and how it is taught. Please arrive in plenty of time, so that the teacher can introduce you to what you are about to see; and please make enough time to watch the whole lesson. There is a short break in the middle of the class where we have tea and biscuits during which, we will be happy to answer any questions about what you have seen and about the club in general. In the summer we sometimes have lessons outside in a private walled garden overlooking the sea which can be a lovely experiance for all . Ki Aikido is suitable for men and women of all ages, shapes, sizes and abilities. 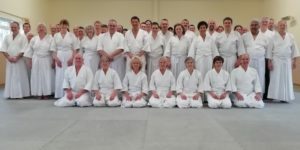 Whether you are a complete beginner, you have practiced something else before or are a visiting Ki Federation member, Torquay Ki Aikido Club will make you welcome and teach you to your own level. If you would like to find out more you are welcome to call Sensei John Doble or alternatively get in touch with him by email. Sensei John Doble has studied Ki Aikido as a member of the Ki Federation of Great Britain for 22 years. We train on Tuesday evenings starting at 7pm to 9pm. It is advisable to call ahead to confirm that a class is running.